Does omega-3 have a protective effect on the rat adrenal gland exposed to 900 MHz electromagnetic fields? The aim of this study was to investigate the harmful effects of exposure to 900-megahertz (MHz) electromagnetic fields (EMF) and the protective effects of omega-3 (Omg-3) against EMF in the rat adrenal gland. Eighteen Wistar albino rats were randomly assigned into three groups, control (Cont), EMF, and EMF + Omg-3. The EMF and EMF + Omg-3 groups both consisted of six rats exposed to an EMF of 900 MHz for 60 min/day for 15 days. No procedure was applied to the six rats in the Cont group. At the end of the experiment, all rats were sacrificed, and the mean volumes of the cortex and medulla of the adrenal gland were estimated using a stereological counting technique. The stereological results showed that the mean volume of the adrenal gland increased significantly in the EMF-exposed groups compared to the Cont group. Additionally, the mean volume of the adrenal gland was significantly lower in the EMF + Omg-3 group compared to the EMF group. We suggest that Omg-3 therapy aimed at suppressing the effects of EMF may prove a safe alternative for animals, whether or not they are exposed to EMF. It is obvious that the EMF-emitting devices surround all of our daily lives. Humans are continuously exposed to potential adverse effects of EMF emitted by transmission lines, mobile phones and electrical devices and that exist wherever electricity is used or generated. The potential adverse health impacts of EMF have led to considerable public anxiety ,. Due to an increasing risk of glioma, a malignant type of brain cancer, closely associated with the use of mobile phones, EMF has been categorized as a group 2b potential carcinogenic for humans by the International Agency for Research on Cancer, an agency of the World Health Organization ,. Several studies have also reported that EMF may have adverse effects on body tissues and systems ,. EMF is considered a stress factor as a result of the high levels of tissue damage it causes . In addition, exposure to high intensity EMF may be a factor in the development of depressive state or metabolic problems . Eicosapentaenoic acid (EPA), docosahexaenoic acid (DHA), and α-linolenic acid (ALA) are omega-3 (Omg-3) fatty acids. EPA and DHA are plentiful in fish oil, while ALA is found in foods such as walnuts, flaxseed and soybeans ,. Omg-3 is a component of the cell membrane structure. It therefore plays a critical role in cell movement, receptor placement and maintaining cell membrane integrity and fluidity . At the same time, Omg-3 exhibits significant antioxidant, anti-inflammatory, anti-hyperlipidemic, antihypertensive, antiatherogenic, antiarrhythmic and anti-platelet effects on biological systems ,,. The adrenal gland has a highly complex structure. It plays a defensive role during stressful situations and facilitates reactions concerning fight or flight decisions. The cells in the adrenal cortex synthesize glucocorticoids (corticoids) and hormones that help to cope with stressful situations . Adrenal medulla cells secrete catecholamine class hormones, such as epinephrine and norepinephrine, that assist instantaneous responses ,. The adrenal corticoid response to EMF stimulation was first examined in the late 1960s . The effect of EMF on biological systems has been investigated in many studies, but few have examined the effects of EMF on the adrenal glands. Furthermore, the protective effect of Omg-3 on the adrenal gland is still unclear. Approximately 3 billion people are exposed to EMF in their daily lives . As a result of the effects of the EMF on biological systems, lipid peroxidation and free radicals increase, resulting in changes in antioxidant activity. EMF thus causes oxidative stress . The purpose of this study was to research the antioxidant effects of Omg-3 on the adrenal gland of rats exposed to EMF. The adrenal gland tissues in this study were obtained from a study that was previously approved by the Experimental Animal Studies Ethics Committee of Ondokuz Mayıs University (No. 2013/20, dated 27.08.2014). In that study, histological and experimental investigations were carried out at the Ondokuz Mayıs University School of Medicine Department of Histology and Embryology. Eighteen Wistar albino rats aged 12 weeks and weighing 230–280 g, were used. Animals were housed separately in plastic cages, at 22 ± 2 °C, under a 12/12-h light/dark cycle and at a humidity level of 40–50%. Animals were randomly and equally divided into three groups, a control group (Cont) (n = 6), an EMF group (EMF) (n = 6) exposed to 900-MHz EMF 1 h/day for 15 days in an exposure tube, and an EMF + Omg-3 exposed group (EMF + Omg-3) (n = 6) exposed to 900 MHz EMF 1 h/day for 15 days in an exposure tube and also given standard feed plus an additional 10% of Omg-3 substances (Sigma Chemical Co., St. Louis, MO, USA). At the end of the 15th day, the animals were anesthetized with ketamine (5 mg/kg i.p.) and xylazine (2 mg/kg i.p.). Following perfusion, the adrenal glands were removed from all rats. The tissues were then processed through graded alcohols (Sigma Chemical Comp., St Louis, MO, USA) and xylene (Sigma Chemical Comp., St Louis, MO, USA) and then embedded in paraffin (Merck, Darmstadt, Germany). Adrenal gland sections 10 μm in thickness were taken, and a systematic random sampling strategy was used . One out of each three sections was randomly selected at the beginning of the study. First, three sections were numbered between one and three, and the first section was selected at random (the third section in our study). Serial sections were subsequently selected systematically (1/3). Between 10 and 13 sections were thus obtained from each adrenal gland. Serial sections were taken from the paraffin-embedded adrenal gland blocks using a rotary microtome (Leica RM 2135, Leica Instruments, Nussloch, Germany). Each section was stained with hematoxylin-eosin. Stereological analysis was then performed using Stereo Investigator version 9.0 software (Micro Bright Field Inc., Colchester, VT, USA). Figure 1: The test-pointing grid. The number of crosses overlaying the section was counted in order to estimate the cut surface area and volume for the slice. The grid size was determined, and coefficient of error (CE) for one subject and coefficient of variation (CV) for the group were estimated as determined in previous pilot studies . Finally, the data elicited were analyzed using One-Way ANOVA and the Bonferroni post hoc test (SPSS 21, IBM Corp., Armonk, NY, USA). p values lower than 0.05 were regarded as statistically significant. In terms of adrenal gland volume, the EMF group differed significantly from the Cont and EMF + Omg-3 groups (p < 0.05). The cortex volume of adrenal gland in the EMF group was significantly greater compared with the other two groups (p < 0.05). The volume of the adrenal zona fasciculate (ZF) and medulla also differed significantly from those of the other groups (p < 0.05). However, there was no significant difference in zona glomerulosa (ZG) and zona reticularis (ZR) among the groups. The administration of Omg-3 resulted in a significant decrease in the volume of the adrenal gland compared to the EMF group [Figure 2]. Figure 2: Adrenal gland total and component volumes (*; p < 0.05). ZG volume was slightly higher in the EMF + Omg-3 group, but the differences among the groups were not statistically significant. Mean ZF volume was significantly higher in the EMF group than in the Cont and EMF + Omg-3 groups, but there was no significant difference between the Cont and EMF + Omg-3 groups. EMF exposure not only increased the volume of the cells, but also the total volume of the ZF [Figure 3]. In the ZR, the mean volume of cells exhibited a slight decrease in the EMF and EMF + Omg-3 groups, but this difference was not statistically significant. The EMF group treated with Omg-3 exhibited significant changes in the volume ratio of the cortex and medulla (p < 0.05). 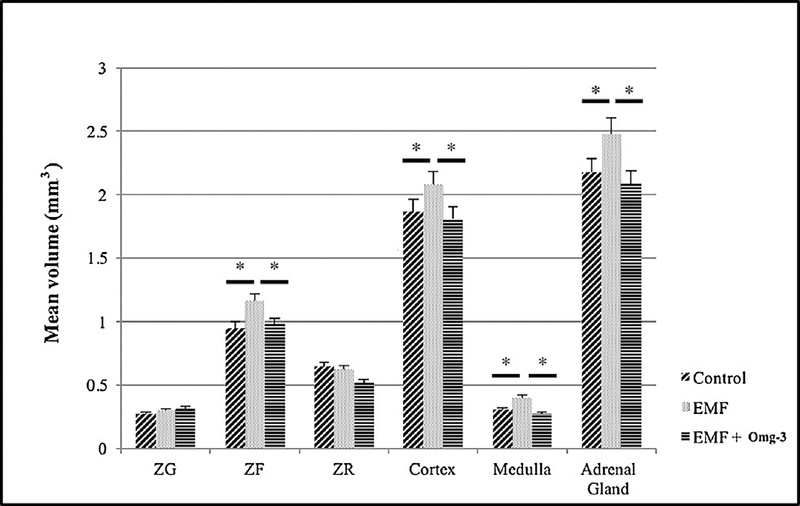 The total volumes of ZF, ZR and medulla decreased more in the EMF + Omg-3 group than in the EMF group (p < 0.05) [Figure 2] [Table 1]. Figure 3: Light micrographs of adrenal glands from the three groups: A (Cont), B (EMF), C (EMF + Omg-3), (*) shows an increased volume and amorphous cells. Table 1: CE and CV values in the experimental groups. In the sections of EMF exposed group, it was seen that not only the border of cells but also cytoplasmic content in the EMF exposed group couldn't be clearly delineated. This may show side effects of EMF exposure on the ultrastructure of cells. Not only integrity of the cell cytoplasm was pronouncedly destroyed in this group but also most of organelles in the cytoplasm of the group were lost. Impaired shapes of nuclei and also an increased number of vacuoles in the cells were seen in the EMF exposed group [Figure 4] and [Figure 5]. Figure 4: After EMF exposure, general structures of cells in the medulla of adrenal gland were impaired, if EMF exposed group is compared to the EMF + Omg-3 exposed. Not only the most of organelles are lost in the EMF exposed group (arrowheads) but also the border of cells in this group cannot be seen clearly. The protective effects of Omg-3 are clearly observed. Figure 5: These pictures were taken from the EMF-exposed group. a) It cannot be clearly observed not only the border of cells but also cytoplasmic content in this group. This may show side effects of EMF exposure. b) The similar side effects are also seen in this figure. c) Integrity of cell cytoplasm was pronouncedly destroyed in the EMF exposed group. Most of organelles in the cytoplasm were lost. d) Impaired shapes of nuclei (arrow) and also an increased number of vacuoles in the cells were seen in the EMF exposed group. e) The unities of cells as well as integrity of cytoplasmic organelles were destroyed in the EMF exposed group. v, vacuole, arrow heads show impairment of unit membrane of nucleus. In the sections of EMF + Omg-3 exposed group, the density of cytoplasm and clear demarcation of unit membranes of organelles would be seen easily as a result of Omg-3 treatment after EMF exposure. Most of nucleus and nucleolus are seen in an intact structure in the cells of this group. An obvious cell border delineation between cells and also clear demarcation of organelles are observed in the Omg-3 treated group. It would be stated a protective effect of Omg-3 after EMF exposure. Double unit membranes of nucleus and intact nucleolus of cells are clearly seen [Figure 4] and [Figure 6]. Figure 6: These pictures were taken from EMF + Omg-3 exposed group. a) The density of cytoplasm and clear demarcation of unit membranes of organelles would be seen as a result of Omg-3 treatment after EMF exposure. Nucleus and nucleo- lus are seen in an intact structure in the cell. b) An obvious cell border delineation between cells and also clear demarcation of organelles are observed in the Omg-3 treated group. Protective effects of Omg-3 after EMF exposure are clearly found in the EMF + Omg-3 group. c) Obvious cell border delineation between cells and also clear demarcation of organelles in the cytoplasm of cells are seen after Omg-3 treatment. Double unit membranes of nucleus (arrowheads) and intact nucleolus of cells are clearly observed. These images would show the protective effects of Omg-3 in the EMF + Omg-3 group. The study results showed that the EMF can alter some morphometric parameters of the adrenal glands. Our results are compatible with those of previous studies ,. Increases in the volume of the adrenal gland and in cortex thickness were observed in the EMF exposed groups. Especially, ZF and medulla volumes showed a significant increase in the EMF group in comparison to control and EMF + Omg-3 groups. There may be different possible explanations for the volume increase. Hyperplasia and hypertrophy may cause a slight increase in this zone in the EMF exposed groups ,. In addition, EMF led to structural degenerations such as swelling, shapeless formation, and light color in the cytoplasm in ZF cells in the EMF groups [Figure 3]. Additionally, glucocorticoid production may be suppressed as a result of degeneration of cells in the ZF due to EMF . Increased cell proliferation may also be associated with EMF exposure ,,. Another noteworthy point is the increased volume of the medulla. Various studies have investigated the effects of EMF on chromaffin cells ,,,. However, the results of these studies were inconsistent, and the effects of EMF on the medulla are therefore still uncertain . However, the increased volume of the medulla in this study showed that EMF may alter the structure of adrenal gland and affect the endocrine system due to the resulting altered cell structure . Stereological studies have shown that the administration of adrenocorticotropic hormone (ACTH) increases ZF cell numbers . An increase in ZF volume under stressful conditions has also been described . ACTH secretion therefore increases under condition of stress , and this may result in enhanced aldosterone secretion. An increased number of cell numbers in the ZG might stimulate a high level of aldosterone secretion. Increases in both lipid levels and mitochondria numbers have been reported after stressful conditions . Several studies also have stated increased cell volumes and mitochondria numbers after exposure to EMF . Studies have investigated the effects of EMF on such biological systems as the ion-transport system, the ligand-receptor mechanism, G protein activation changes , direct damage in covalent DNA bonds , and metabolic elements such as ATP, cAMP, mRNA, and proteins ,. These adverse effects of EMF derive from alterations in the cell respiration process that generate free radicals after exposure to EMF . Omg-3 is a therapeutic agent that reduces oxidative damage . Omg-3 has immunomodulatory activities that are effective on gene expression, protein transcription factors and cellular signaling pathways ,. It is well known that, EMF shows its effects via oxidative stress. Oxidative stress may damage cellular calcium channels and increases inflammation . At this point, Omg-3, known for its anti-inflammatory properties , enhances the effect of antioxidant enzymes by regulating expression of genes and plays an important role in stabilizing oxidative stress in the cell . The present study suggests that Omg-3 can affect the molecular mechanism of cells exposed to EMF and thus reduce oxidative stress. Thus, the volume of the ZF decreased in EMF + Omg-3 group. In conclusion, the use of EMF-emitting devices is increased all the time. Exposure to EMF significantly increases the volume of the adrenal gland, and especially that of the ZF, in rats. Due to the tissue damage it causes, EMF is regarded as one of the principal stress factors . The results of this study show that the adrenal gland is susceptible to EMF and that Omg-3 exhibits protective effects against EMF. We suggest that our experimental model may be a useful guide for further experiments intended to clarify the mechanism of interaction among EMF, Omg-3 and the adrenal gland. The tissues examined were acquired from a study supported by the Ondokuz Mayıs University project management office (PYO. TIP.1904.13.023). Bas O, Odaci E, Kaplan S, Acer N, Ucok K, Colakoglu S. 900 MHz electromagnetic field exposure affects qualitative and quantitative features of hippocampal pyramidal cells in the adult female rat. Brain Res 2009;1265:178-85. Odaci E, Bas O, Kaplan S. Effects of prenatal exposure to a 900 MHz electromagnetic field on the dentate gyrus of rats: a stereological and histopathological study. Brain Res 2008;1238:224-9.
WHO. Electromagnetic fields and public health: mobile phones; 2014 (Accessed 02 July 2017) http://www.who.int/mediacentre/factsheets/fs193/en/. WHO. Electromagnetic fields and public health; 2007 (Accessed 02 July 2017) http://www.who.int/peh-emf/publications/facts/fs322/en/. Bas O, Odaci E, Mollaoglu H, Ucok K, Kaplan S. Chronic prenatal exposure to the 900 megahertz electromagnetic field induces pyramidal cell loss in the hippocampus of newborn rats. Toxicol Ind Health 2009;25:377-84. Szemerszky R, Zelena D, Barna I, Bardos G. Stress-related endocrinological and psychopathological effects of short- and long-term 50 Hz electromagnetic field exposure in rats. Brain Res Bull 2010;81:92-9. Mantzioris E, Cleland LG, Gibson RA, Neumann MA, Demasi M, James MJ. Biochemical effects of a diet containing foods enriched with n-3 fatty acids. Am J Clin Nutr 2000;72:42-8. Mirnikjoo B, Brown SE, Kim HFS, Marangell LB, Sweatt JD, Weeber EJ. Protein kinase inhibition by omega-3 fatty acids. J Biol Chem 2001;276:10888-96. Valentine RC, Valentine DL. Omega-3 fatty acids in cellular membranes: a unified concept. Prog Lipid Res 2004;43:383-402. Stone NJ. Fish consumption, fish oil, lipids, and coronary heart disease. Am J Clin Nutr 1997;65:1083-6. Alexander JW. Immunonutrition: the role of omega-3 fatty acids. Nutrition 1998;14:627-33. Masters C. Omega-3 fatty acids and the peroxisome. Mol Cell Biochem 1996;165:83-93. Idemura H. Abnormal production of adrenal gland hormones-special reference to glucocorticoids. Nihon Naibunpi Gakkai Zasshi 1991;67(Suppl. 3):730-9. Kononen J, Soinila S, Persson H, Honkaniemi J, Hokfelt T, Pelto-Huikko M. Neurotrophins and their receptors in the rat pituitary gland: regulation of BDNF and trkB mRNA levels by adrenal hormones. Brain Res Mol Brain Res 1994;27:347-54. Sato T. Abnormal production of adrenal gland hormones-special reference to adrenal-medulla hormones. Nihon Naibunpi Gakkai Zasshi 1991;67(Suppl. 3):746-53. Barnothy MF. Biological effects of magnetic fields on small mammals. Biomed Sci Instrum 1963;1:127-35. Fragopoulou AF, Koussoulakos SL, Margaritis LH. Cranial and postcranial skeletal variations induced in mouse embryos by mobile phone radiation. Pathophysiology 2010;17:169-77. De Iuliis GN, Newey RJ, King BV, Aitken RJ. Mobile phone radiation induces reactive oxygen species production and DNA damage in human spermatozoa in vitro. PLoS One 2009;4:e6446. Altunkaynak BZ, Onger ME, Altunkaynak ME, Ayranci E, Canan S. A brief introduction to stereology and sampling strategies: basic concepts of stereology. Neuroquantology 2012;10:31-43. Altunkaynak ME, Ozbek E, Altunkaynak BZ, Can I, Unal D, Unal B. The effects of high-fat diet on the renal structure and morphometric parametric of kidneys in rats. J Anat 2008;212:845-52. 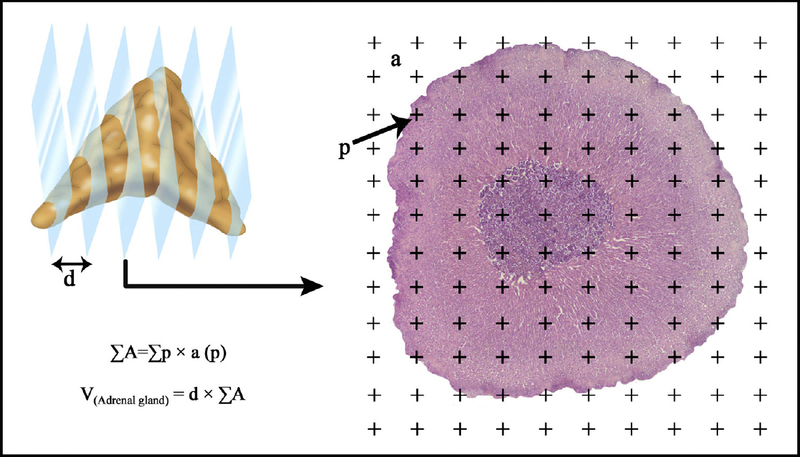 Tunc AT, Turgut M, Aslan H, Sahin B, Yurtseven ME, Kaplan S. Neonatal pinealectomy induces Purkinje cell loss in the cerebellum of the chick: a stereological study. Brain Res 2006;1067:95-102. Mikolajczyk HJ, Kamedula M, Kamedula T. Biological accounts emerging from some kinds of electromagnetic waves in the environment. Pol J Occup Med Environ Health 1993;6:263-71. Uscebrka G, Zikic D, Matavulj M, Milosevic V, Lazetic B. Stereological analysis of the adrenal gland of female rats after exposure to an electromagnetic field. Acta Vet-Beograd 1996;46:277-84. Koko V, Djordjeviae J, Cvijiae G, Davidoviae V. Effect of acute heat stress on rat adrenal glands: a morphological and stereological study. J Exp Biol 2004;207:4225-30. Hori T, Inoue N, Suzuki H, Harakawa S. Exposure to 50 Hz electric fields reduces stress-induced glucocorticoid levels in BALB/c mice in a kV/m- and duration-dependent manner. Bioelectromagnetics 2015;36:302-8. Grant DN, Cozad MJ, Grant DA, White RA, Grant SA. In vitro electromagnetic stimulation to enhance cell proliferation in extracellular matrix constructs with and without metallic nanoparticles. J Biomed Mater Res B 2015;103:1532-40. Lee HM, Kwon UH, Kim H, Kim HJ, Kim B, Park JO, et al. Pulsed electromagnetic field stimulates cellular proliferation in human intervertebral disc cells. Yonsei Med J 2010;51:954-9. Sul AR, Park SN, Suh H. Effects of sinusoidal electromagnetic field on structure and function of different kinds of cell lines. Yonsei Med J 2006;47:852-61. Tsuchimochi H, Nakamoto T, Matsukawa K. Centrally evoked increase in adrenal sympathetic outflow elicits immediate secretion of adrenaline in anaesthetized rats. Exp Physiol 2010;95:93-106. Craviso GL, Chatterjee P, Maalouf G, Cerjanic A, Yoon J, Chatterjee I, et al. Nanosecond electric pulse-induced increase in intracellular calcium in adrenal chromaffin cells triggers calcium-dependent catecholamine release. Ieee T Dielect El In 2009;16:1294-301. Craviso GL, Chatterjee I, Publicover NG. Catecholamine release from cultured bovine adrenal medullary chromaffin cells in the presence of 60-Hz magnetic fields. Bioelectrochemistry 2003;59:57-64. Olivares-Banuelos T, Navarro L, Gonzalez A, Drucker-Colin R. Differentiation of chromaffin cells elicited by ELF MF modifies gene expression pattern. Cell Biol Int 2004;28:273-9. Verdugo-Diaz L, Palomero-Rivero M, Drucker-Colin R. Differentiation of chromaffin cells by extremely low frequency magnetic fields changes ratios of catecholamine type messenger. Bioelectroch Bioenerg 1998;46:297-300. Yoshida-Hiroi M, Bradbury MJ, Eisenhofer G, Hiroi N, Vale WW, Novotny GE, et al. Chromaffin cell function and structure is impaired in corticotropin-releasing hormone receptor type 1-null mice. Mol Psychiatr 2002;7:967-74. Nussdorfer GG, Rebuffat P, Mazzocchi G, Belloni AS, Meneghelli V. Ivestigations on adrenocortical mitochondria turnover: i. Effect of chronic treatment with ACTH on the size and number of rat zona fasciculata mitochondria. Cell Tissue Res 1974;150:79-94. Buuck RJ, Tharp GD, Brumbaugh JA. 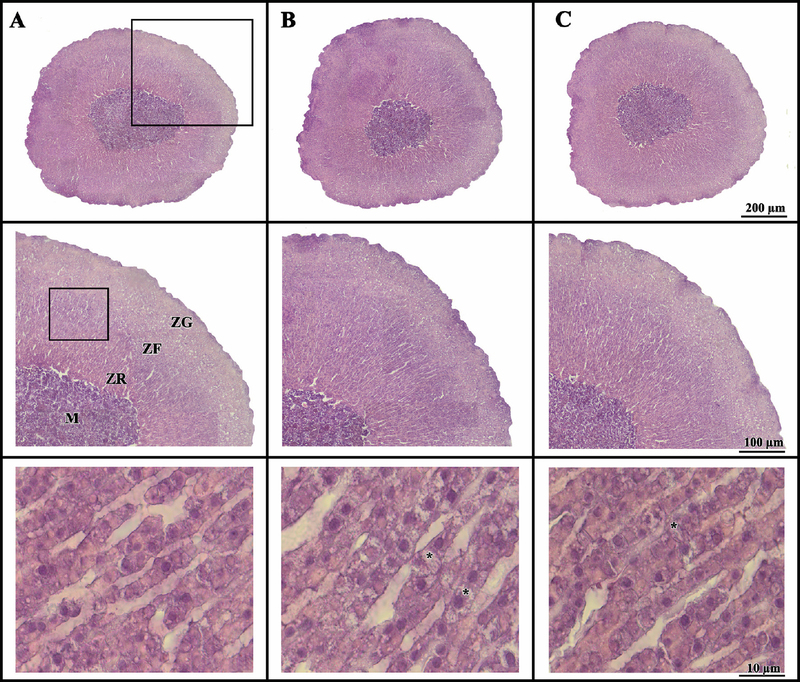 Effects of chronic exercise on the ultrastructure of the adrenocortical cells in the rat. Cell Tissue Res 1976;168:261-70. Aguilera G. Regulation of pituitary ACTH secretion during chronic stress. Front Neuroendocrinol 1994;15:321-50. Vallejo D, Picazo ML, Sanz MP, Bardasano JL. Hematological alterations induced after a year’s exposure to extremely low frequency magnetic field in mice. Int J Dev Biol 1996;(Suppl. 1):297S-8S. Roy S, Noda Y, Eckert V, Traber MG, Mori A, Liburdy R, et al. The phorbol 12-myristate 13-acetate (PMA)-induced oxidative burst in rat peritoneal neutrophils is increased by a 0.1 mT (60 Hz) magnetic field. FEBS Lett 1995;376:164-6. Cain CD, Thomas DL, Adey WR. 60 Hz magnetic field acts as co-promoter in focus formation of C3H/10T1/2 cells. Carcinogenesis 1993;14:955-60. Liburdy RP. Biological interactions of cellular systems with time-varying magnetic fields. Ann N Y Acad Sci 1992;649:74-95. Berg G. Effect of artificial electromagnetic fields on living organisms. Gematol Transfuziol 1992;37:28. Gorczynska E, Galka G, Wegrzynowicz R, Mikosza H. Effect of magnetic field on the process of cell respiration in mitochondria of rats. Physiol Chem Phys Med NMR 1986;18:61-9. Khan MW, Priyamvada S, Khan SA, Khan S, Naqshbandi A, Yusufi AN. Protective effect of omega-3 polyunsaturated fatty acids on L-arginine-induced nephrotoxicity and oxidative damage in rat kidney. Hum Exp Toxicol 2012;31:1022-34. Liburdy RP, Callahan DE, Harland J, Dunham E, Sloma TR, Yaswen P. Experimental-evidence for 60-Hz magnetic-fields operating through the signal-transduction cascade — effects on calcium influx and C-Myc messenger-Rna induction. FEBS Lett 1993;334:301-8. Chandrasekar B, Fernandes G. Decreased pro-inflammatory cytokines and increased antioxidant enzyme gene expression by omega-3 lipids in murine lupus nephritis. Biochem Biophys Res Commun 1994;200:893-8.